J. Francis MacDonald (1932-2014) was a fiddler, piper, storyteller, artist, singer and composer. As a piper with the Black Watch, he played at the World Fair in Seattle, on The Ed Sullivan Show, for The Royal Family and for US President JF Kennedy. As a fiddler he performed at countless house parties, concerts and dances and was a successful teacher. 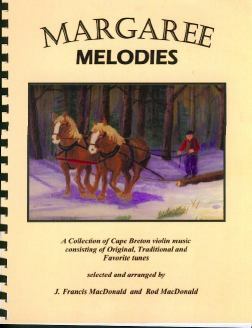 In the '90s he recorded a fiddle instructional video, and in 2006, he and his son Roddie released Margaree Melodies, a book consisting of both original and traditional fiddle music. There were about 80 tunes in this book. Currently revisions are on hold following Francis' passing.